The best stories, sites and fun from around the Great Lakes State. As of June 2018, Michigan has a total of 1,051 operational turbines. Plans underway show a total of 1,084 turbines becoming operational in 2018. Michigan ranks 14th in the nation for installed wind turbines. There are at least 26 manufacturing facilities in Michigan producing components for the wind industry. DTE Energy ranked 7th in the nation for utility ownership of wind power capacity in 2017. 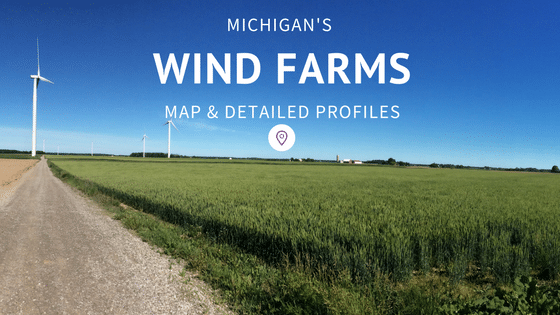 See the Michigan Interactive Wind Farm Map available on Thumbwind. I have to wish you for your great work and i request you to continue by updating informations like this. If you think about it, it makes sense. The routes that the native Michigan tribes made and utilized for thousands of years cover the same ground that Michigan Department of Transportation has paved and we are using today as we cross the state to visit friends in Chicago visit the wineries in Traverse City or watch the Thanksgiving parade in downtown Detroit. Amazingly, Michigan's first trails were not made by Indians but ranging buffalo herds in migration. This was especially true on the St. Joseph trail in Southwest Michigan. The major trails in lower Michigan tended to link Indian settlements of Mackinac, Detroit, Saginaw, and Niles. The area around Saginaw had the most native American settlements in the Great Lakes region. Can You Climb Turnip Rock? Turnip Rock has been deemed one of the Amazing Rock Formations in America by CNN. Indeed its one of the most photographed attractions in the Upper Thumb. However, the unique rock formation is located on private land and considered part of the Pointe Aux Barques cottage community. Access to Turnip Rock is only available as a guest of a member of Pointe Aux Barques community or if you access by water with a kayak or canoe. That being said you must stay in the water or right along the edge of the water. Fall Color on Michigan's First Scenic HighwayA fall color driving tour along the shore of Lake Huron and Saginaw Bay is an easy one day jaunt from Southeast Michigan. We take a look at the highlights along Michigan's first scenic highway, the 93 miles of M-25.